The Wedding Day is often considered one of the biggest days in a person’s life. And every bride, and maybe a groom or two, has dreams of curating a timeless, yet unique wedding. The last thing you want is just another cookie-cutter celebration. You want it to be special! That being said, there are endless opportunities to incorporate your own flair and personality into the wedding, from the large-scale moments to the smaller details. Take a look at some of the unique wedding ideas you could include in your big day. No rule says you have to follow up the wedding vows with a traditional dinner and a dance floor. It’s all up to you and your fiance to decide what you want. For instance, some newlyweds have rented out carnivals with rides and games, while others have hosted the reception at karaoke bars, sports stadiums (for the photos at least), museums, or even on a cruise ship. Our recommendation: Go nuts with the cake and use it as a beautiful photo-op that also tastes delicious. Try to think outside of the box beyond the traditional white cake with a bride and groom sitting atop. There are no limits to your imagination, and it is your wedding day after all. To begin, you don’t even have to have a cake for dessert. For instance, you may want a 6 tier donut cake or an assortment of pies. Or, you can get creative with the shape of the cake, and build one that resembles something you or your spouse loves, like a guitar, NASA, or perhaps a Reese’s Cup. The bouquets are another detail that you can easily customize and play with, and flowers aren’t your only option. Instead of flowers or succulents, or in addition to them, you can add jewelry, such as a collection of new and vintage colored brooches. On the other hand, some brides and bridesmaids have carried bouquets of colorful origami, seashells, balls of yarn, or even cotton candy down the aisle! Thank your guests with a party favor that shows off who you are as a couple, as well as something they will use. For example, put together personalized tote bags, like a ‘Hangover Kit’ filled with post-wedding hangover cures including aspirin, water, and snacks. It’s so simple yet brilliant, and your dehydrated and tired guests will thank you. Or, if you are having a summer wedding outside, sunglasses are a great favor as well. And, while they may not be the most original ideas, bottle openers, coasters, shot glasses, and single-use cameras will never go out of style. The wedding food is one of the most memorable portions of a wedding. So, consider what you and your significant other like, but also remain cognizant of what will appeal to your guests. 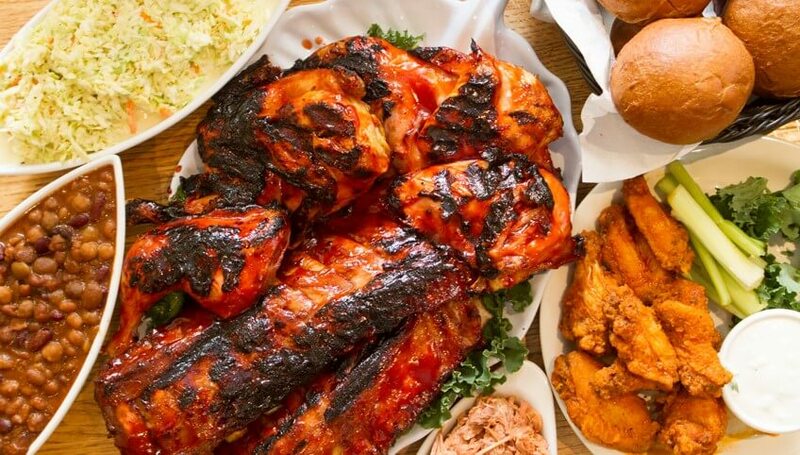 We like to think that BBQ is always a crowd pleaser, and it is unique too. Experience the quintessential Maryland cuisine with Adam’s Wedding Catering! At Adam’s, we provide full-service catering, fresh BBQ on site, as well as a wide selection of delicious side options. We truly love our community, and we are proud to provide wedding catering to the happy couples in Maryland. Adam’s Grille is a full-service catering company that is much more than just ribs. In combination with affordable prices, an extensive menu selection, and presentation services, you are sure to impress your guests. We know that this is an exceptional day, and we’ll make sure that everything is picture-perfect. Contact us today with any questions or unique wedding ideas you may have.